Inaudible question from woman with heavy accent, perhaps Scandinavian or German. Clearly the question was related to Guru Dev, Shankaracharya Swami Brahmanand Saraswati, and of spreading the teaching of meditation. 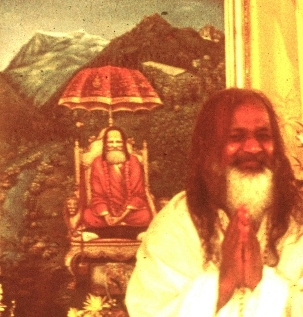 Maharishi Mahesh Yogi - Oh he must have known! [audience laughter] He never, nnnmmmm, he never said to me. Otherwise quite a lot of time would have been wasted in planning. [audience laughter, slow at first, then uproarious] He saved us from that waste, [audience and MMY still laughing] waste of planning. It just blossomed and blossomed and blossomed and blossomed. Male questioner - You have said in the latter years Guru Dev initiated quite a number of people. Was he using the, the EXACT technique that you are using? MMY - [pause] Must be using BETTER techniques [MMY laughing slightly] than I am using. Same male questioner - Was he still using the long mantras and all of that? Female in audience - Huh! MMY - [pauses] It's very difficult for me to find out what he was using. [laughter from audience] Because initiation is all in private ... [he pauses and audience laughs, MMY giggles and laughs too] ... And I was never interested who was given what mantra. I was interested in myself. [laughter and giggling] ... Full of divine radiance. People don't have to do the mantra and meditation in his presence. [male member laughs] Just ... the transformation was in his air, so full of life ... Out of that fullness I started to teach. [MMY pauses, slight audience laughter] At least by practice people could rise and raise themselves up. 'But the great impact of Guru Dev, in his lifetime, in bringing out so clearly and in such simple words, this technique of TM. And his, his blessing for, for this movement which came out much after he left his body. Because there was no, no occasion during his lifetime for, for any of his intimate blessed disciples to go out of his presence and that's why this any such movement to bless the world couldn't have started during his time'. Right from the very early times, MMY definitely claimed that the meditation he teaches (TM) was taught to him by Guru Dev. A look at page 244 of 'Thirty Years Around the World' (a TMO publication by Maharishi Vedic University, 1986) confirms this. 'At whose door the whole galaxy of gods pray for perfection day and night. Adorned by immeasurable glory, preceptor of the whole world, having bowed down to Him, we gain fulfilment. 'This was done by us, I didn't compose those lines, because I am not a Sanskrit scholar, but this was done by a, very, very eminent Sanskrit poet of Banares, and he was, such a mysterious man, the poet 1. He used to live us, just like us, and a good pandit, and when some, some pandits, learned people used to come to pay their respects to Guru Dev, and he would sit like that. And generally it is traditional, that in the presence of Shankaracharya, pandits gather. Pandits mean the learned people, highly great intellectuals of the country. They sit together, and they, try to bring home to Shankaracharya, each one of them, that he is the greater pandit than the others. And these dialogues are so highly intellectual and so very interesting, because they, everyone wants to, to win the grace of Shankaracharya, apart from his spiritual development for their material glorification, because a certificate from the Shankaracharya, of the great learning of the pandits will make him flourish in his area. So, they, very beautiful, and this pandit he used to defeat everyone, because he was a born poet, poet. He would versify anything that he wants to say. In poetry he would speak. And when in poetry, and so fluent and so high-class, so, high-class fluent Sanskrit poetry, and others would just sit and listen to him, what he says. He was very dear, sweet pandit. He wrote lots of stanzas of Guru Dev, absolutely and, and this was one of them. What happened was... this is very interesting.... this great pandit in his flight of, of the poet, he wrote Guru Dev's life, and he, he didn't know Guru Dev's life. Because all the time was spent in loneliness in the jungles, and, nobody would know. And he said to me, "I am going to write." And I said "Yes, you write", and this was our agreement that I'll get it printed, and he wrote, and I enjoyed it so much, but someday it was to come to Guru Dev for sanction. So, Guru Dev, he enjoyed hearing the whole thing. It was highly scholarly and very great, and everything that, that a good poet could put in that, he put it. And then, when it was finished Guru Dev said, "It's very good, yes." And when the pandit went out of the room he asked him to take it to the Ganges, tie it down with a big stone, heavy, put it in the Ganges. And I, it was a shock to me, I said "But, but there are beautiful passages in it". He said, "Nobody should read it, tell him to take it", it is because he didn't know his life and he said "If you don't put it in the Ganges I'll ask someone else to do it." I said, "I'll do it". We would have used all those beautiful, sen... poetry. These days you would have enjoyed all. But he wouldn't allow it to remain. 1. The poet was 'Ashu Kavi', Pandit Veni Madhava Sastri. "It's a very beautiful question and very sweet, the question was and still is, Guru Dev must have been fully enlightened. Now after leaving the body nothing remains in the Relative, just Absolute. Then how do we invoke and to whom? And if nobody is to be invoked, then what is the use? Some such similar question I asked Guru Dev once, what happened was naturally people come to the ashram from all over India to pay respects to Guru Dev, once or twice a year according to their own convenience. And when they would come they would narrate all sorts of stories, the child was sick or they had a law suit, all sorts of difficulties and then thinking of Guru Dev, that thing disappeared. And hearing all these things for a long time, one night I asked Guru Dev 'What is this?' These people don't even write to Guru Dev, Guru Dev doesn't know they are in difficulty on the surface of life and then how do they report they had a vision or some thought of Guru Dev and then from that time everything started to be smooth? And it took me about two years to understand because I quite remember the time what is meant by it's 'The department of the Almighty'. And now I understand it is this. We have the picture of Guru Dev as when we do puja and that form, that photo, that picture is the physical expression of the form which had a mind that was fully enlightened and Omnipresent. So once we see the form our eyes associate with the form very naturally because the physical and mental run parallel. And once the form is in our vision, in our awareness, then naturally our mind gets in tune with the mind which occupied that form once upon a time. The form was occupied by a mind, that mind is an all time reality, eternal, the barriers of time are no barriers to it, continuum. The body is no more but the form is there and once we tune our eyes our vision, perception, cognition to that, because that was held up by a mind that was enlightened, naturally our mind gets in tune and because that mind was and is and will forever be Omnipresent, immediately our mind gets in tune with the Omnipresent and right away the help comes from where we are. The help comes from Absolute Being which is the nature of our own mind, but that image, that picture becomes a positive and concrete medium to have that mechanics performed for our mind. So help comes from our own Being because it comes through that form naturally our devotion to that. It's the department of the Almighty which does it, not the individual, its the department and it's only one way, it's not two ways, its one way. The help is not given, it's received, it's received by our ability to attune with that, and that ability develops with devotion, surrender and service. These three things. Automatically one is elevated to that level and help doesn't come from outside, it comes from right where we are, from our own Being. But those unaware of ones own Being have those mechanics to help them. This is true of all the saints of the times throughout the world"